9/11/2014Share this story on Facebook! 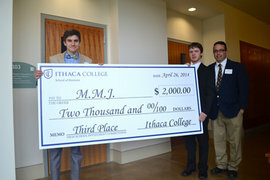 This fall Ithaca College will give high school students the opportunity to gain hands-on stock market trading experience through the second annual High School Investment Competition. Teams of three to six students from high schools throughout the Northeast will each be given $500,000 in virtual dollars to build a portfolio that consists of 5 to 20 stocks. Students will make their initial trades on October 3 and teams will be allowed to reallocate their funds four times throughout the competition, which ends on March 27. Teams and their advisors will be invited to the School of Business for a live portfolio performance ranking, tour of the facility, and an opportunity to meet finance faculty members. The investment money may be virtual, but the stakes are very real. The three teams with the best-performing portfolios will receive monetary prizes. The winning team will receive $2,500 for themselves and $2,500 for their school.